A cabinet can stand alone, be built into a wall, or attached to a wall. 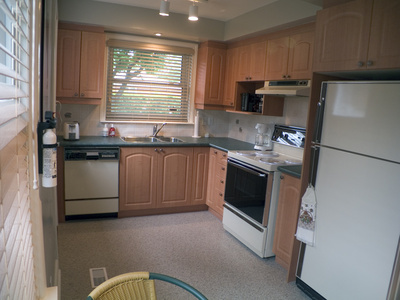 Refinishing or refurbishing your cabinets is a quick and inexpensive way to remodel a kitchen or bathroom. Instead of replacing your outdated cabinetry, you can update it by repainting it, antiquing it or simply changing the hardware. These alternatives will still give your kitchen or bathroom a new look and feel and will save you the hassle of having new cabinets installed. Painting is one of the easiest ways to update the look of the cabinet. If you decide to paint a cabinet, make sure that you first remove all the hardware and sandpaper as much as the previous paint and/or finish that was previously on the cabinet. Once that is done, apply the new paint using a brush. Apply paint coats as needed and allow the paint to dry before reattaching any hardware. Making your cabinets look antique is another way of refinishing and giving your cabinets a new look. While may seem counterintuitive that making your cabinets look old makes them look new, the fact is that antiqued cabinets go well with eclectic or classic interior design styles. Antiquing cabinets is not only a great way to make your cabinets look like new cabinets, it is also cheap and easy. All you have to do is sandpaper and stain or paint your cabinets until they take on the desired antique look. Give your cabinets a new finish by replacing the hardware with different hardware. Simply changing the knobs, studs and hinges on a cabinet can make that cabinet look like a whole new, modern and updated cabinet. Replace outdated knobs with modern knobs or modern knobs with classic knobs, depending on your style, and you’ll see a huge improvement in your cabinets.